People are able to live life free from harm where our community has a culture that does not tolerate abuse; works together to prevent abuse and knows what to do when abuse happens. The Hull Safeguarding Board is a statutory board formed under the Care Act 2014. 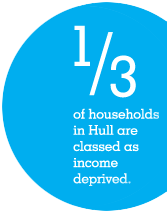 It consists of senior members from Hull City Council, Humberside Police and Hull NHS Clinical Commissioning Group. It has an independent chair, Rick Proctor. The Board is the strategic lead body in Hull for safeguarding adults with care and support needs that may be suffering or at risk of abuse or neglect. The Care Act places statutory functions on the Board. It must publish a strategic plan, write an annual report and conduct a safeguarding adult review if an adult with care and support needs dies and abuse or neglect is suspected. The terms of reference and the strategic plan can be found on the Resources page under Policy Documents.